Happy Black Friday everyone! I usually spend the day shopping by myself but I’m actually pretty much done my Christmas list so today I am going to switch over the house from Thanksgiving to Christmas (and then possibly go shopping tomorrow LOL). I really enjoyed pushing myself to blog weekly during the One Room Challenge (you can check out my final Guest Bedroom reveal here) so I’m going to try to keep the momentum going and do a Friday post each week if I have something fun to share. 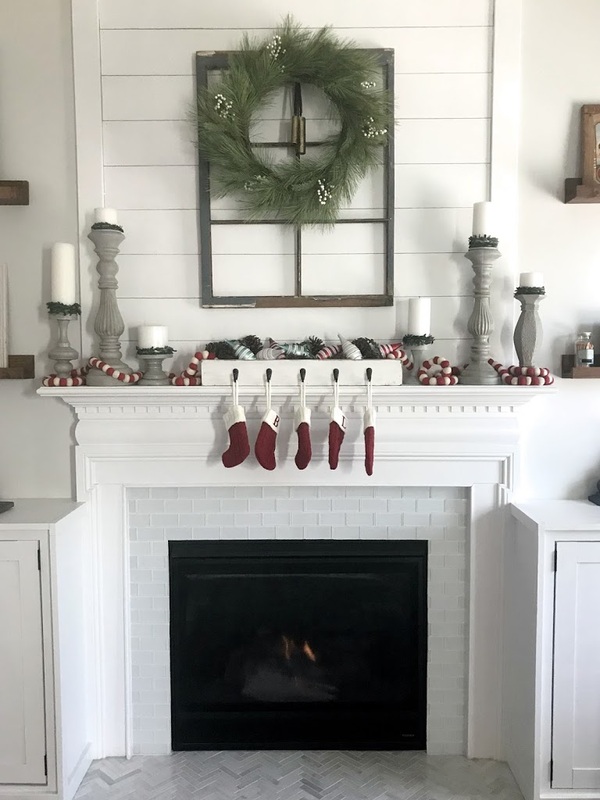 To kick off the season I’m sharing a few pics of my mantel decked out for the holidays – which I couldn’t resist putting together before Thanksgiving. 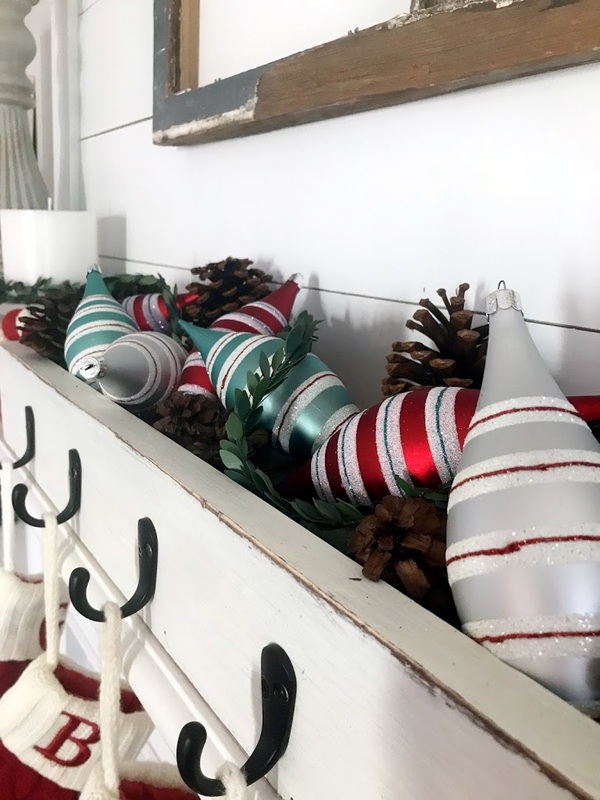 I picked up this wreath during the Hearth and Hand launch at Target and it was too pretty to put away for a month….so then I just kinda leaned into it and kept going. As much as I love all things white these days, my husband loves decorating our XMas tree with multi-colored lights, so this year I’m trying to figure out a way to blend the two into something we both love. 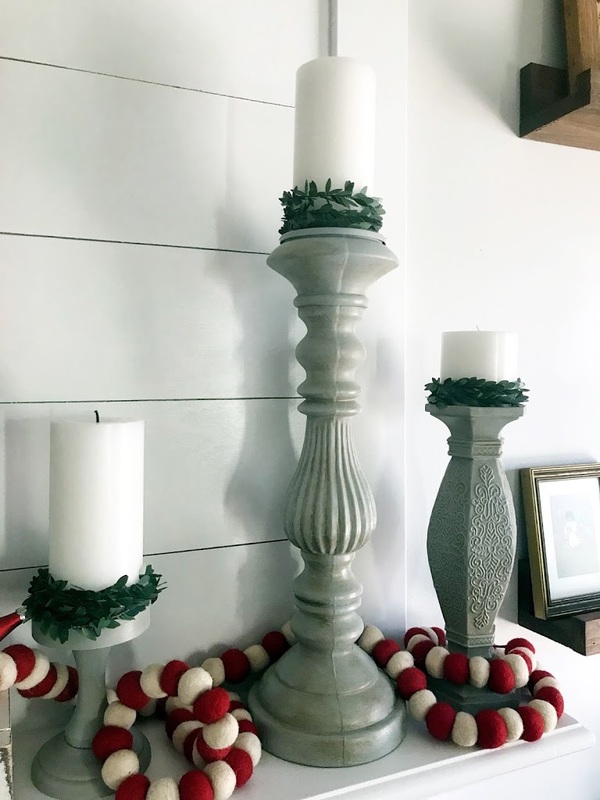 The colors I’m going with are blue (the antique window frame), green (the wreath), and classic Christmas Red…along with a lot of white, gray, silver, and gold. 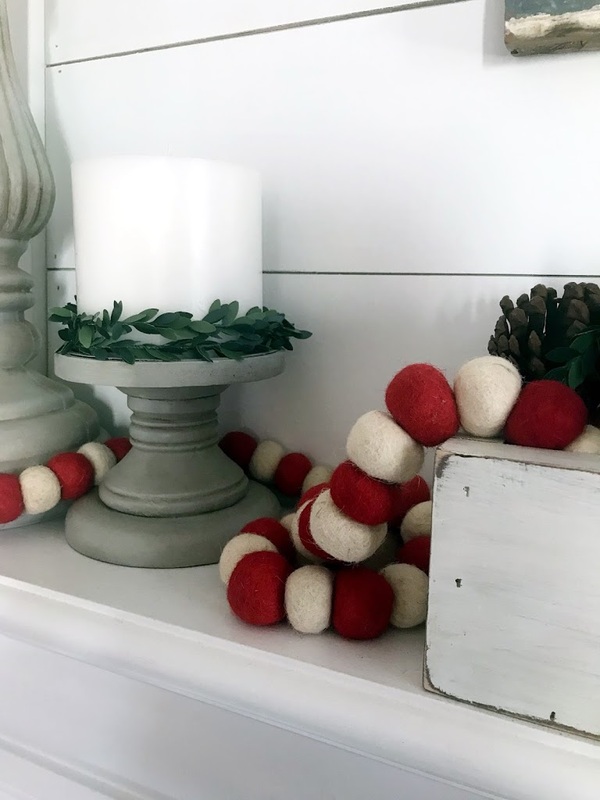 I saw someone share this red and white pom-pom garland on Instastories and ran out to Michaels to grab it (and I’m glad I did because it’s totally sold out now!) and then winded two strands around my candlesticks, which I’m keeping gray this year but would love to change out to something different next time. 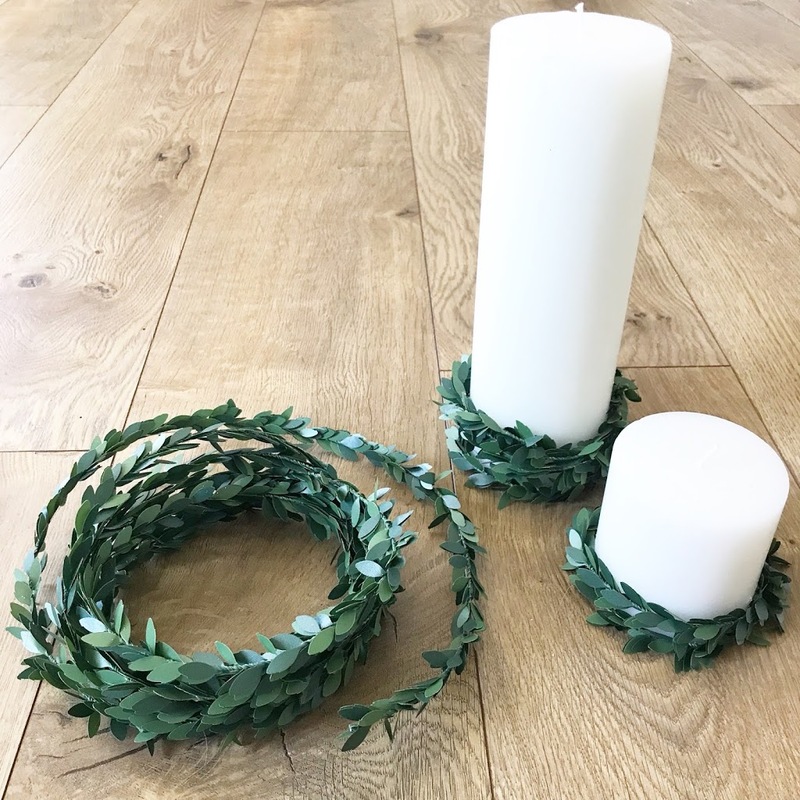 To keeps the garland in place I like to use a few craft glue strips or dots….they’re nice and sticky but I can get them off easily when I’m done. 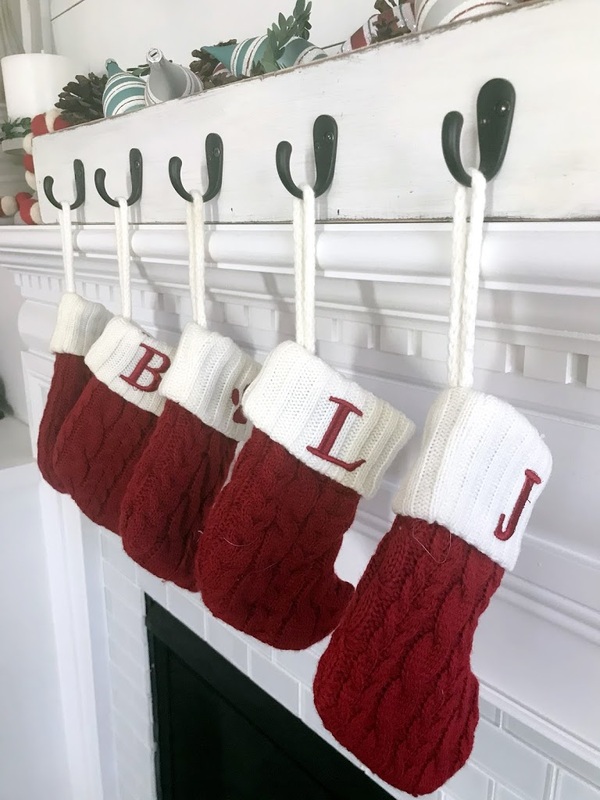 The stocking holder I built last year (if you are interested in a good beginner building project this is perfect – you can totally build just using hand tools and this tutorial from Shanty 2 Chic is great…or you can always shoot me a note and I’d be happy to build you one!) 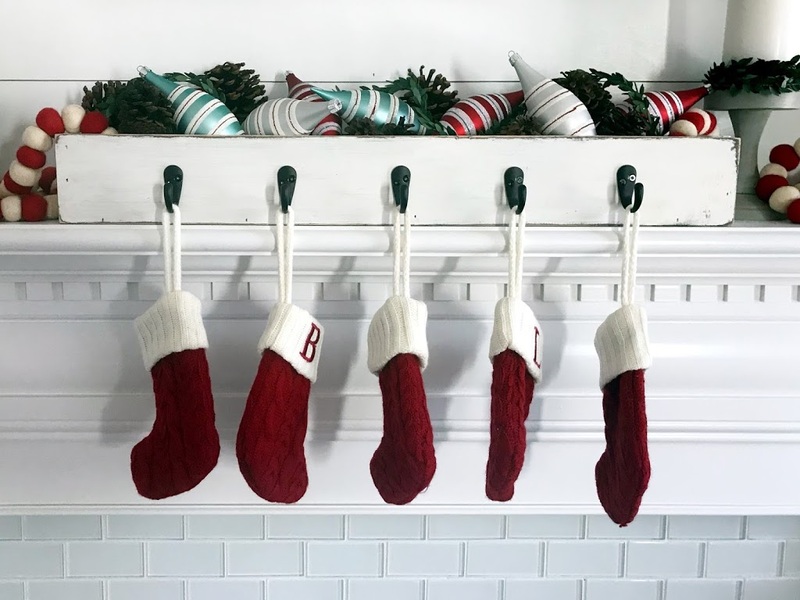 The little red stockings are from Kohl’s….I like to keep the small ones down here so the kids can’t pull them down as easily. I have some Styrofoam blocks on the bottom of the box, and then I filled it with some pine cones (which are great to pick up super cheap after Christmas), some ornaments I found at Michaels, and the leftover Target Garland. I want to try to add something in front of the fireplace, but I’m pretty happy with how everything is coming together! Hopefully these smaller weekly posts are fun to read….next week I have something new I want to try out, but until then…enjoy the long weekend! Keeping things simpler this Christmas, without losing the holiday magic!